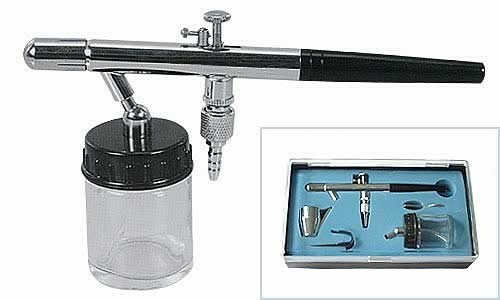 The Artlogic range of airbrushes have been selected for their quality and reliability and present excellent value for money. Made of rugged chrome-plated brass these precision manufactured airbrushes are not only well suited to the home hobbyist but are ideal for light professional use. This is a Double Action Internal Mix airbrush. Push the trigger down for air then back for fluid. The amount of backward movement controls the amount of fluid released. This allows the user to change the width of line and opaqueness of colour with one hand. Internal mix provides a very fine atomisation giving excellent performance results. Comes in a Display Pack with fluid tip wrench. Also included is a “User Guide/Spare parts sheet”. This airbrush does not come with a hose so if you are buying an ArtLogic compressor as well, you will need ArtLogic hose set HE008-3 available in ‘Airbrush Accessories’. The Sparmax compressors however, do come with hoses that fit this airbrush. This product was added to our catalog on 29/05/2007.